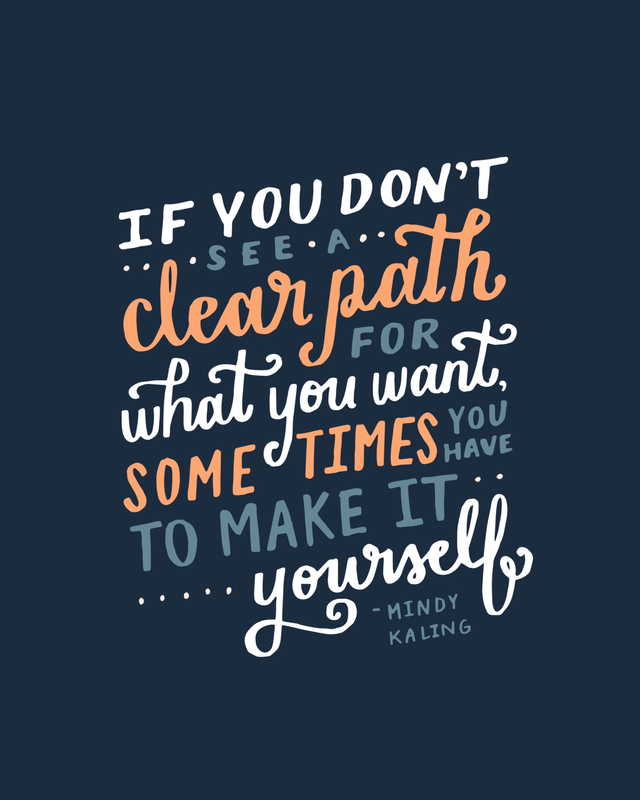 This isn't a card story but I decided to throw it back to a post I wrote about one of my favourite Mindy Kaling quotes, in celebration of her 39th birthday, of course. Growing up, once in a while, my parents would look at me with a scowl and say “once you get something in your head you won’t stop until you get it done.” It was usually along the lines of seeing a pair of cool shoes on TV and begging them for months until they caved. As it turns out, the quality that always used to ruffle my parent’s feathers has proved to be one of my best. Once I set my sights on something, I go to great lengths to get it done. This trajectory doesn’t always end well of course. I come across many disappointments and failures but I can attribute this quality to many of the ‘successes’ in my adult life. Why do you see a seemingly unrelated Mindy Kaling quote? It seems random but that quality of mine and this quote are very much connected. I didn’t see a clear path of what I wanted but I knew I wanted to do a lot of things. Everything, if we're getting specific. Sitting at my desk chair shuffling ads through email wasn’t going to get me there any time soon. So I got a few ideas in my head. At the time, I knew the ideas were far fetched, but my stubborn, childhood quality flicked on and away I went. I’m not much of risk taker. I’ve said it before ‘I don’t seek thrill.’ The particular quality I’ve been talking about has tricked me into taking risks many times. It’s allowed me to be so focused on the end result that I’ve taken risks without realizing it was scary. *See also, “it’s not aways the destination but the journey” or something like that. You can buy this print in two different sizes here.